18 students graduated from ITM Nursing School in Karawa last year, and all 18 passed their national exams! 100% of their class are now nationally-certified nurses. This rare accomplishment has set a new benchmark for the school and has put these students at the top of their class nationally. The diligent hard work of the students and professors is admirable, and often comes at great sacrifice from the individuals and their families. The majority of students live in dorm-style rooms at the school and are responsible for their own food. Their days must also be structured around the daylight hours, as any studying done after dark is without electricity. These are students fully dedicated to becoming nurses, passionate about being able to heal and save lives in their communities. We congratulate this graduating class! This year, there are 23 students ready to take their exams. Join us in prayer for them as their exams begin in early July. Pray for peace of mind, and that their hard work and dedication will be reflected in their test scores so that they may all pursue the jobs in nursing that they are so passionate about. Meet Nadej. Nadej is a 21 year old student in her third year of the lower-level Nursing school (ITM). She wants to be a nurse because she has always had a passion to help others. She lives in a dormitory with other students, which is not equipped with running water or electricity. Nadej wakes up at 5:30 every morning, walks to fetch water, and prepares her own food, if she has it. Some nights, she studies by candlelight and goes to bed hungry. She is supported by her parents, who made the tough decision of which child to send to school. Nadej fears that her education will be too burdensome for her family, and that she may have to drop out of school. 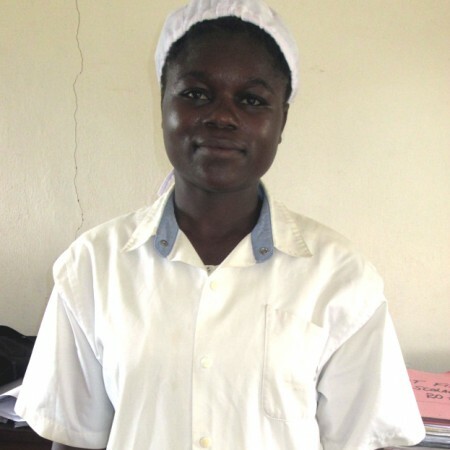 But she continues to work hard, and hopes that as a Nurse she will be able to support her family. Nadej is grateful for the opportunity to be in nursing school and work towards a brighter future.